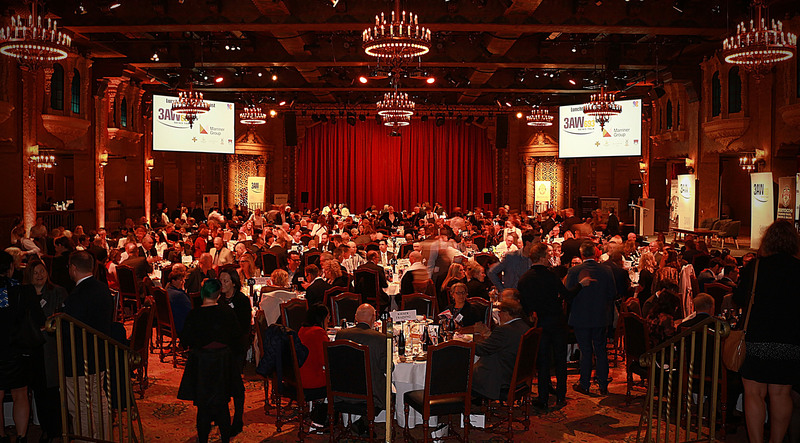 Attended by almost 500 guests, the 3AW Lunchtime Rumours Feast held today at the Plaza Ballroom was again a fabulous afternoon of food, fun and fundraising for the benefit of thousands of vulnerable children and families we support each year. In fact, the event smashed last year's total, money raised totalling almost a quarter of a million dollars. Hosted by Hamish McLachlan, the event kicked off with singer and four times World Irish Dance Champion Bobby Fox. John Silvester and CPS CEO Aileen Ashford followed, discussing the awful realities of domestic violence and all its flow-on effects. This segued to a video featuring two participant mums whose lives have been changed by the Children and Mothers in Mind program. Punting pals Hamish and Ross Stevenson shared the mic next, the latter providing a broad range of amusing anecdotes - all told in Ross' inimitable style. Other 3AW Breakfasters, including Jon Anderson, Peter Ford and Jon Silvester also entertained, 'Sly's' dry wit and turn of phrase adding tremendous value. After another performance by Bobby Fox, the auction kicked off with sensational prizes and determined bidders proved the perfect combination, serving to contribute over $125,000 to the grand total. We thank our tireless event organisers Elaine Marriner, Margaret Robinson and Leonie McNicol, our volunteers and the following event partners. 3AW 693, Macquarie Media, Marriner Group, De Bortoli Wines, Elaine & David Marriner Family, Marriner Group and Staff, CHANEL Australia, Bertocchi Smallgoods.